Lady Kendra Townsend is in a dilemma, marry the horrid, ancient man whom her uncle wants or get sent to the Americas to live with her mother’s sister and brother-in-law. When she chooses America over a loveless marriage, her uncle ships her off and puts her in the care of the American sea captain Dorian Colburn, a man who reminds her of a pirate in every way. After getting burned by a conniving and rueful woman, Dorian Colburn never wants to get involved with one ever again. But when Kendra comes aboard his ship, much to his chagrin, he can’t help but be drawn to her. Neither were looking for love. 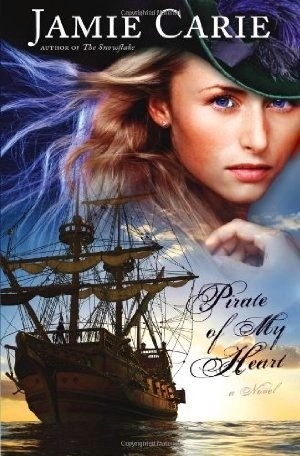 But when they start to fall for each other, will their pasts and hesitations collapse the relationship before it begins or will he really become the pirate of her heart? Jamie Carie is one of those authors that I always wanted to read but just never had the opportunity, until now. I wasn’t disappointed in the quality of the story. Ms. Carie has a wonderful gift of storytelling and she has an attention to detail that makes the story more enjoyable for the reader. Being able to read this book was no chore and I just couldn’t put it down. I’m particularly happy with the time frame that this story is set in, one of my favorites, the late 18th century. A time when America was still rough and sailing by wooden boat was the only way to cross the seas. The author didn’t disappoint in capturing the feel of the roughness of the environment and the feel of life in that timeline. There was one slight disappointment in the story, though a small one. The fact that the time spent on the boat dominated so little of the story was something I didn’t expect, but it turned out to work out very well in the storyline and, if we’re being honest, this whole story wasn’t what I expected. It’s so different from my expectation, yet the reality of what the story was about and where the story was going wasn’t a disappointment, in fact, it was a joy to discover that I had no clue where this story was going to lead. This story really isn’t typical in any sense of the word. Throughout the whole book I was trying to guess what was going to happen next and most of the time I was wrong. That’s a new experience for me, and I enjoyed the mystery. The main genre for this book is romance, but expect some well laid suspense plots and some drama. The book played off of the damsel in distress card as Kendra continued to get herself into fixes that she never intended. However, this damsel doesn’t always wait for Prince Charming to bust through her door to rescue her, she takes matters into her own hands and trusts the Lord that she’ll make it out of any situation alive, making her character more endearing. The characters in this story have own characteristics and their own personalities. Even the rival of Kendra has her own personality, no matter how nasty it is. The author made all of the characters fears and hesitations completely realistic. Dorian doesn’t want to be tricked and hurt again and Kendra doesn’t want to make a bad decision and be hurt again by someone she loves. This author knows that the best part of the story is realistic characters with founded fears and hesitations. One thing this story doesn’t have is a passionless romance. The author made it a priority to make this one with enough passion to keep you interested but not enough to make you uncomfortable. I prefer this type of romance because, in my opinion, they’re more realistic. This author was determined to make electricity zing in every kiss and touch making the story a real romance. The suspense keeps you on your toes. It strikes when you least expect it, catching you off-guard. As soon as you stop anticipating an attempted kidnapping, etc. it hits leaving you reeling. It’s a real doozy too. It seems like Kendra’s family won’t stop until she’s married and they’ll do almost anything to make it happen. You can’t help but wonder why. Due to the surprise factor, I won’t tell why but I do encourage you to read the book and find out. Overall, a pleasant surprise from what I expected, with a captivating storyline and characters, a strong plot, and a perfect romance. This book is perfect for anyone that loves a historical romance with more spice than the usual and a dash of suspense. I rate it four and a half out of five. I received this book free for this review from Net Galley and B&H Publishers. All opinions are my own. Kelli London always dreamed of becoming a singer/songwriter and she hoped that Brian would be a part of her dreams, with kids and a house together. Until a mistake changed their lives forever. Now Kelli is back in contact with Brian collaborating on an album with him. Now she needs to learn and apply a hefty amount of forgiveness. Heather Anderson’s life has spiraled out of control, leaving her reeling. When he finally hits rock bottom she cries out to the only One who can save her. Now, she’s trying to trust Him and completely change the views that she’s been taught and the lifestyle she’s created. Kelli and Heather create an unlikely friendship where encouragement and faith is prevalent. They both try and get through the hardships that they’ve been with a little help from each other and from a few other friends as well. This book is beautifully written and magically delves into the problems that a lot of people face today. The after affects of an abortion, trying I move on after infidelity, and realizing your mistake in being the other woman are just some of the issues this author addresses in the story. The issues are also solved by the author by showing that God is the only One who can save you and fully forgive and forget what you’ve done. Though this book is written so well with realistic problems, reactions, and characters, I found myself struggling to really get into this book. I was never drawn into the storyline and I didn’t find it hard to put the book down. Though I do wonder if it’s because of me and not the author. I didn’t hate it but I didn’t like it either. There’s no real light side to this story and it can’t in any sense of the word be considered a “light read”. This book is filled to the brim with drama, heartache, and redemption. The theme of the book is forgiveness, with both forgiving others and yourself a solid theme in this book. The author did a glorious job of making every fear and pain from the past realistic and understandable. The pain of abortion, the pain of a cheating spouse, the pain of being the other woman; they’re all discussed and delved into making you feel the pain of each character. There was a ton of healing though not a ton of romances. The major being between Kelli and Brian, but it was a small part and didn’t up not even five pages of the story. Their relationship grows from exes to friends and I guess that’s the romance period. Though, with as much drama as there was in this book the romance would have been in the way instead of a plus. But I still missed it in this story. With this story’s theme what it is, you can expect that God is a very prevalent factor in this book. The faith of the characters is the most important factor in the author’s mind. In my opinion, it’s very important that it’s there in a Christian book. This author did not disappoint. God’s everywhere in this book. The characters lean on Him in trouble and pray constantly to Him. It’s very refreshing to read a Christian with mention of God throughout. 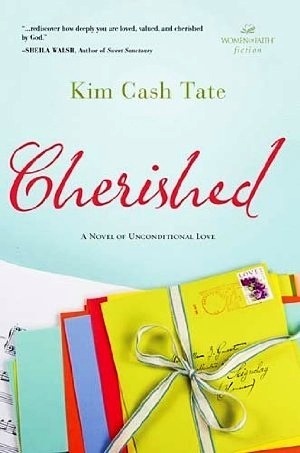 Though this book wasn’t my cup of tea, it was beautifully written and realistic, I think middle-aged women or anyone who has experienced the issues addressed in this book. I give this book a two out of five. This book was given to me by Booksneeze for this review. All opinions expressed are my own.